The Form Builder is a website add-on tool that allows you to create your own forms, which can then appear on your website. Forms can be used to send yourself an email, add details to your contact database, and add new leads to your CRM. When you are logged into your Website in The Webconsole, click on Form Builder on the menu on the right. Form Name - Give the form a name, it is visible to you and the client. Confirmation Message - Type the message you want your users to see once they have filled in the form. Redirect to URL - Redirect the user to another page on your website or an external website. From Email - The address the email is sent from. You can set it to be sent from the sender by selecting that field in the form. To Email - The email can be sent based on a number of rules. Single Email - The form is sent to the email address you place in the "Email" field. All my users - All the users added to The Webconsole will receive the email. Roles - The email will be sent to all The Webconsole users that are assigned a certain role. Round Robin - Used for sales teams to distribute leads evenly. Label Position - This will detemine where the label appears in relation to the field the user is filling in. Include Captcha - A Captcha will prevent SPAM programs from filling in your form. Send Auto-Responder - An auto responder is an email that is automatically sent to the person who filled in the form. Web Hook Integration - This feature allows the contents of the form to be sent to a third party application as XML or JSON. It is used by organisations that want to integrate the form into existing software that they may have for running their business. Attach the submission as a CSV - The input from the form is added to a csv file, which is attached to the email. Save Submission as a Contact - If you select "Yes" for this option, you can add the form to your contact database. You match the form fields up to their field in the database when you add the field in the Form Builder. 3. Click on "Save Form", which will direct you through to the editor. Field Label - This is the label that will appear next to the field. Field Type - This is the field you dragged from the left-hand menu. You can change the type if you need to. Description - The description field is displayed below the field as a tool tip to help website visitors filling in the field. Default Value - If you want a value to be pre-filled in the form you can add it here. Limit Input Length - If you want to ensure that the input in this field is within a certain number of characters you can select "Yes" and set a minimum and a maximum number of words, or characters. Size - The width of the field in the form. Required - If you want to force visitors to fill in the field, tick this box. Forms with too many fields discourage visitors from using them. Database Marketing Contact Field - If you have selected "yes" to "Save Submission as a Contact" in the Form Settings, you can match this field with its custom field in the contact database. 5. Your form will be saved as you progress. 6. Your form will not appear on the website until you have added it to the menu, or linked to it from within a page in your website. When you are logged in to your Website account, click on Form Builder on the menu on the left. 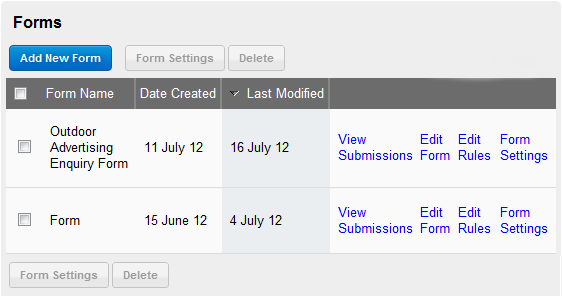 Next to the form you want to see the submissions for, click "Submissions". This will open up a page where you can see all the submissions by Clicking on "View Email" next to each one. We also record the IP address and the date the form was submitted. On occasions, you may want to supplement an element on your Form with more information. This is particularly useful for questions that may not be self-explanatory. The Form Builder has an inbuilt feature that allows the person filling out the form to roll their mouse over a ? icon in order to see more information about how to complete this field. Sometimes you will want elements in an online form to be compulsory. This is especially true for fields such as Name and Contact Details. The element is now compulsory. If the person filling out this form tries to submit the form without completing this element, a notice will appear and the form will not be submitted.